With a win Sunday, Jared Goff would become the second-youngest quarterback to win the Super Bowl. Most quarterbacks drive the bus to the Super Bowl. Their play is so sharp that it’s a major factor in their team’s advance through the postseason. A few, however, are merely passengers on the bus. Based on his performance so far in the playoffs, Los Angeles Rams quarterback Jared Goff, who will face off against Tom Brady and the New England Patriots in the Super Bowl on Sunday, may be a part of this second group. This is strange considering all that Goff accomplished in the regular season: He was top five in the league in yards per attempt and top 10 in passer rating, threw 32 touchdowns to 12 interceptions, was named to the Pro Bowl for a second straight year and was even a leading MVP candidate. But that Goff was absent from the divisional and championship rounds of the playoffs. Through the first three rounds of the playoffs, Goff’s overall performance as measured by Total Quarterback Rating is 62.8, according to ESPN’s Stats & Information Group.1 Among the 26 postseason performances by quarterbacks who have played in the Super Bowl since February 2007 (including Brady’s 2018 postseason to date), Goff’s ranks 20th. That’s more than 10 points worse than the average Super Bowl quarterback over the same span (73.7). And it’s nearly 23 points short of Brady’s current postseason performance, the best of his six seasons in the sample. 6 Tom Brady 2018 Patriots 91.5 85.6 ? 20 Jared Goff 2018 Rams 79.5 62.8 ? It’s easy to write off Goff’s lackluster postseason to the small sample size of two games, but the problem for the Rams is that this is a continuation of a larger trend: Goff’s performance has been in a free fall during the second half of his season. Over the nine games that Goff played from Week 10 through the conference championship (a span that covers 358 dropbacks), his Total QBR was 54.6, which ranks 21st out of 31 qualifying quarterbacks.3 Brady’s number over the same time period (76.9) ranks second, behind only Sam Darnold of the Jets.4 Goff was barely better than Denver’s Case Keenum (53.3). Goff’s yards per dropback, which factors in sacks and yards lost to sacks, has dropped a league-worst 2.32 yards. A good part of this decline can be explained by the inability to capitalize on what had been the bread and butter of the Rams’ passing game, the play-action pass. When passing after faking a handoff to the running back, Goff has averaged 7.39 yards per dropback since Week 10, which is a far cry from the 10.90 he gained in the first half of his season (on 112 and 107 dropbacks, respectively). Goff’s QBR on play action is down 20 points compared with the first half of his season. The big play that often came via play action is also lacking from the Rams’ offense. The team has managed 3.2 passing plays of 20 or more yards per game since Week 10, just under the NFL average. In the first half of their season, however, the Rams averaged 5.1 big passing plays per game, tied with the Chiefs for the league lead. In the playoffs, the Rams have been even less explosive, with just six big passing plays in two games, four fewer than the Patriots have. To be fair, Goff has not been operating with the same supporting cast. His best player, star running back Todd Gurley, has been hurt, limited or rusty since just before Christmas. And Goff has clearly missed his most efficient receiver this year in yards per target, Cooper Kupp, who tore his ACL in Week 10. Goff, just 24, has the opportunity to take Brady’s spot as the second-youngest quarterback in history to win a Super Bowl. But doing so will likely require Goff to again be the quarterback he was in the first half of his season. 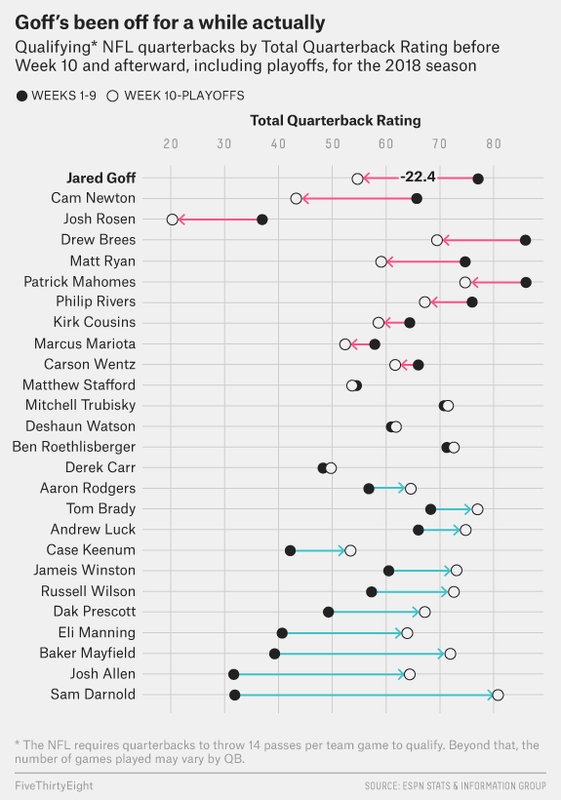 Total QBR is a metric on a 0-to-100 scale that incorporates all of the quarterback’s contributions to winning on all of his plays, adjusting for opponent quality. Since the 2006 season, the only Super Bowl MVPs who have not been quarterbacks were on teams whose quarterbacks advanced to the big game despite playoff performances that were worse than Goff’s — Manning in the 2015 season, Russell Wilson in the 2013 season and Ben Roethlisberger in the 2008 season. The NFL requires quarterbacks to throw 14 passes per team game to qualify. Beyond that, the number of games played may vary by QB.